This is the Asteroid Ceres imaged over a 4 hour period. A total of 180 exposure were taken, at 2 seconds each. Every 30 minutes 20 exposures were taken giving 9 individual images. The asteroid moves that far in just a half an hour! The motion is from the lower left of the frame toward the upper right. You might notice the gap between the sixth and seventh exposure. There were light clouds drifting through and I took the exposures 5 minutes earlier than usual. 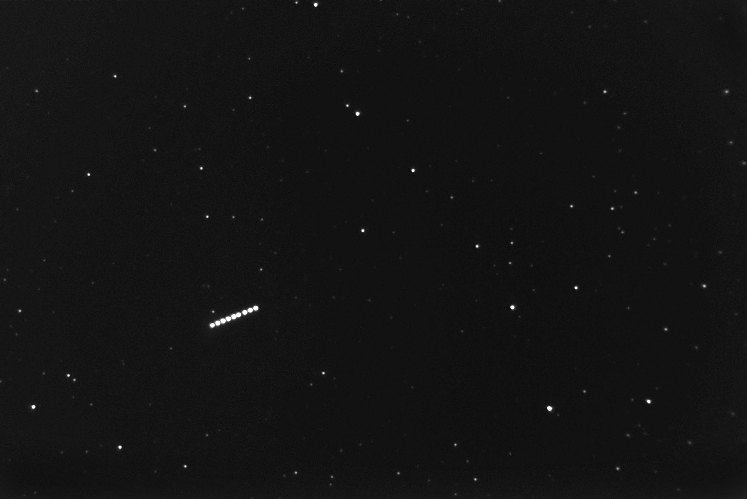 I didn't think this would be noticeable, but even a 5 minute period is enough to detect this asteroid's motion! Here we see the 9 individual frames displayed as an animation. Note: This image was used in a short video clip at the Harvard Museum of Natural History meteor exhibit.